Plain and Simple White Bread, originally uploaded by Camemberu. OK, bread experiment no.2 - this time a little more traditional, with proper kneading and such. I followed Delia's online recipe - which was really easy. To be honest, I had more fun doing this than the no-knead bread. The kneading process (only three and two minutes) was like PlayDoh fun. 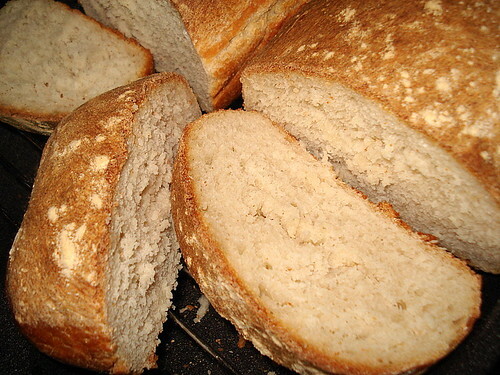 This bread turned out just as well - crisp crust with soft fluffy insides. Less chewy and more dense (the air bubbles are smaller). It tasted delicious on its own, and even more so with a dab of butter.